Whether you’re a local estate agent or a multi-national pharmaceutical corporation, there’s one thing that unites many businesses across the world – projector usage. Once considered a luxury, data projectors and data projection equipment are now standard issue in companies everywhere. However, whilst projectors have gotten smaller, brighter and cheaper over the years, they remain something of a confusing item to purchase. What Images Will You Show? There are four types of media you can show on a projector. These are: data, video, photos and games. Every projector on the market can show any of these media, but it’s important to note that projectors are often specialised for one type of media over another. 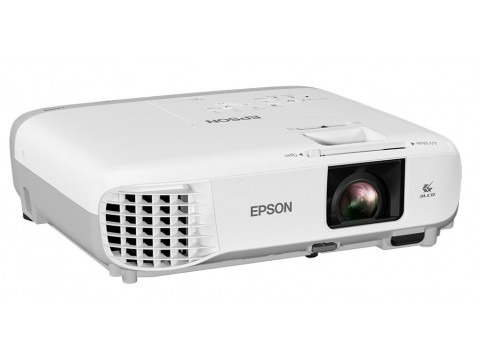 For example, a data projector will be best at showing static, bright images with great clarity (perfect for presentations and spreadsheets), whilst a gaming projector will put greater emphasis on refresh rates and a video projector will focus on delivering true-to-life colours and smooth movement. For a business, we always recommend data projection equipment. Do You Need a High Resolution? The resolution of your projector will determine its clarity. Much like a TV, the fewer pixels your projector can resolve, the blurrier it will look when blown up to a larger size. For displaying small graphics, lots of text or detailed artwork, higher resolution projectors are recommended, especially if you’re planning on projecting at a large size. Do You Need a Portable Projector? Portability is an often-underrated trait of projectors, but could your business benefit from it? Well, if your business often has employees presenting to clients, it could be a vital feature. Do You Need a Widescreen Projector? In the projector market, you’ll find that there are two formats available 16:9 and 4:3. The former of the two is a ‘widescreen’ format, similar to that you’ll find on most televisions. This is a wider, more cinematic format designed for enjoying video primarily. 4:3, on the other hand, is closer to most PC monitor designs and closer to a square. This gives greater height, making documents and presentations easier to read. How Bright Should Your Projector Be? One of the biggest differentiators for projectors is their brightness. Typically rated in lumens, the brighter a projector is, the better you’ll be able to see its output in well-lit rooms. For home cinema projectors, the average use case is in a darkened room, so brightness isn’t a vital issue. For a business though, it’s worth investing in a projector with a higher lumen output, typically over 2,000 lumens, in order to ensure that it’s visible in a well-lit office environment. Does Your Projector Need Audio? Not every projector comes with built-in speakers, with many requiring a hook up to external speakers to produce sound. For those purely planning on projecting presentations, this might not be an issue. If, however, you have mixed media applications in mind, it’s worth considering whether the convenience of built-in audio is worth it. Previous PostHow Have Commercial Displays Advanced?